Tripoli—Youssef Sawani did not recognize the Saif Qaddafi who appeared on Libyan state television shortly after revolution erupted across the country earlier this year. Sawani knew Saif as a fellow reformer. But there was no denying it: there, on television was the son—and presumed successor—of the since-deposed Libyan leader Muammar Qaddafi announcing, “We will not sell Libya short. We will fight to our very last man, woman, and bullet.” These were the words not of a technocrat, but a man of war. “Was Saif al-Islam lying all all along?” Sawani told me he asked himself. He was not alone in posing that question. The volte-face of Saif Qaddafi—from Western-backed reformer to self-imposed international paraiah—remains one of the Arab Spring’s enduring mysteries. 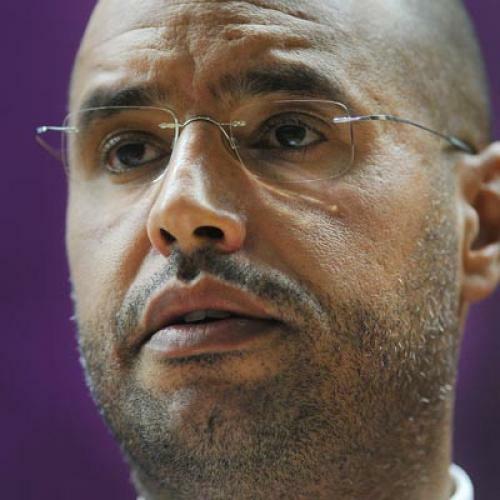 Many outside observers assumed that Saif al-Islam was committed to the cause of making Libya a better, freer place. For Sawani, however, Saif’s decisive betrayal of liberalism came as less of a surprise, coming as it did after years of close interaction—years in which he observed repeatedly how Saif lacked the courage of his convictions. ON FEBRUARY 16, Sawani met with Saif for a heated discussion that lasted for hours. Sawani reports that he told the dauphin “the hour of decision has arrived,” and that the regime “must make real concessions or else there will be a bloodbath.” Though Saif was not entirely moved by Sawani’s urgency, he sent him to speak with his father’s chief political advisors. In a subsequent meeting with General People’s Congress Secretary Muhammad Zwai and his aides, Sawani recommended that Qaddafi admit he had made mistakes, release political prisoners, and embrace real reform. But Zwai rejected his counsel, and told him to pass along a message: “Go tell Saif his father says there will be no changes.” It was to be the last in a long series of exasperating attempts to persuade the regime’s strongmen to reform. Sawani had once been much more hopeful. When Saif emerged on the political scene at the end of the 1990’s, Sawani and like-minded reformers were optimistic. The younger Qaddafi spoke about modernizing the antediluvian regime by establishing political parties and private media. When Islamists arrested after skirmishes in 2002 were punished by having their beards shaved off, he criticized the government. He also spoke out against the pervasive corruption that enriched his father’s friends at the expense of average citizens. To implement his ambitious vision, Saif surrounded himself with intellectuals and businessmen who had studied and worked abroad. He worked closely with a number of these men, such as the rebels’ de facto Prime Minister Mahmud Jibril and their Justice Minister Muhammad al-Alagy. They wrote policy papers about liberalizing the economy and discussed ways to open up an ossified political system. Sawani, a political science professor who trained in England, was among the reformers who enjoyed Saif’s protection, as was made clear when he was selected as head of the Qaddafi Foundation four years ago. The organization had been set up to implement civil society programs, curtail the abuses of the security services, and push for free speech: In a country considered among the most authoritarian in the Arab world, this was a radical proposition, one that would have been impossible without the backing of Muammar Qaddafi’s son. The foundation did have a number of successes, organizing the release of Islamist prisoners and helping draft a constitution. But Sawani’s group walked a very thin line and they sparked heated critiques from regime reactionaries. Thus, reformers were instructed not to use the word “political” in titles, compelling them to speak of the “social system” instead. The elder Qaddafi pointedly refused to adopt the constitution offered for his consideration. As their proposals were repeatedly shelved, it became increasingly apparent that Saif’s initiatives were merely intellectual exercises that his father had no intention of implementing. “We moved an inch only to lose a mile,” Sawani laments. Saif's newspaper and television station were frequently shut down. His attempts to reign in the security services and force them to account for their abuses floundered. Minor economic reforms stalled. “has a reputation for making sensational public announcements about new initiatives and then not following through.” In a pun on Saif's name, which means Sword of Islam, Libyans dubbed him Saif al-Ahlam, or Sword of Dreams. Sawani was clear-eyed about the gridlock he and other reformers faced. “We knew the limits,” he admits. “We had doubts about the regime’s intentions. But we said there is no other option.” But what Sawani never counted on was Saif’s timidity. “He could not confront his father. Every time he faced opposition from his father, Saif buckled and went abroad.” Sawani points out that, once his father had rejected it, Saif refused even to publish the constitution that his group had drafted. But Sawani’s assessment of Saif is far more damning—though, over the course of our interview, he often felt compelled to temper his portrait. “It is too soon to make declarations about his performance,” he cautioned. “We need to review what we did and what he did wrong. We just don’t have all the facts before us.” Perhaps he is looking for a way to protect his own reputation amidst the fallout. But the facts that Sawani has already presented do not suggest that Saif was ever a plausible liberal leader for Libya.